SINGAPORE — Asian markets were mostly lower on Friday as caution set in ahead of U.S.-China trade talks in Beijing next week. 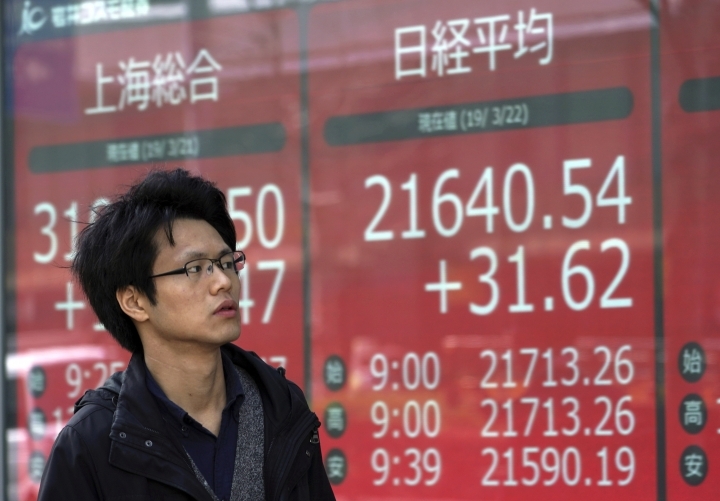 The Shanghai Composite index gave up 0.8 percent to 3,077.56 and Hong Kong's Hang Seng lost 0.5 percent to 28,913.55. The Kospi in South Korea was flat at 2,184.94. 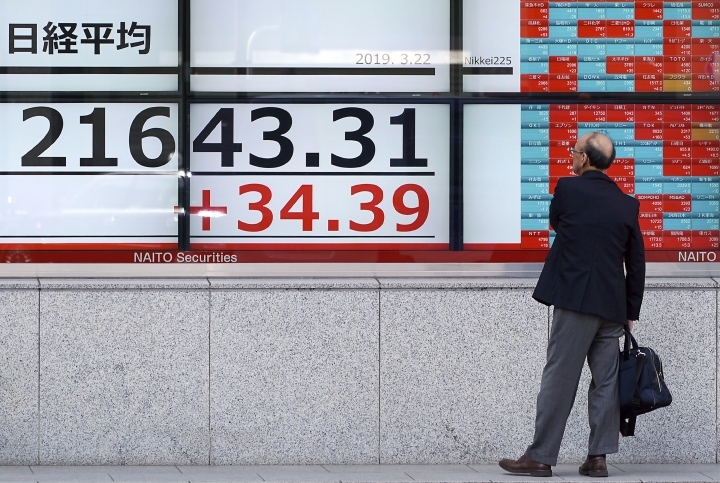 Japan's Nikkei 225 index, reopening after a market holiday, dropped 0.2 percent to 21,453.10 after a report that inflation slowed slightly in February. The core consumer price index rose 0.7 percent from a year earlier, compared with January's 0.8 percent gain. A preliminary private survey, which was also released on Friday, put the country's manufacturing purchasing managers' index at 48.9 in March, unchanged from the previous month. Numbers below 50 indicate contraction on a 100-point scale. Australia's S&P ASX 200 gained 0.6 percent to 6,201.60. Shares fell in Taiwan and most of Southeast Asia. China's commerce ministry said Thursday that U.S. Trade Representative Robert Lighthizer and Treasury Secretary Steven Mnuchin will visit Beijing for the next round of high-level trade talks. Ministry spokesman Gao Feng said that the eighth round of negotiations will take place next Thursday and Friday. He said Chinese Vice Premier Liu He will meet with officials in Washington in early April. While officials from both countries have maintained that they are positive about inking a deal, they are still seeking a middle ground on big issues like China's technology policy. Other matters could still be up for discussion too. On Thursday, CNBC, citing two sources familiar with the matter, said President Donald Trump wants China to "double or triple" its offer to buy up to $1.2 trillion of American products over six years. On Wall Street, news that the Federal Reserve no longer intends to raise interest rates this year spurred a rally in technology stocks, snapping a two-day losing streak. The broad S&P 500 index rebounded 1.1 percent to 2,854.88 and the Dow Jones Industrial Average gained 0.8 percent higher to 25,962.51. The technology-heavy Nasdaq composite jumped 1.4 percent to 7,838.96. The Russell 2000 index of smaller-company stocks advanced 1.2 percent to 1,562.41. In other trading, benchmark U.S. crude oil lost 10 cents to $59.88 per barrel in electronic trading on the New York Mercantile Exchange. It dropped 25 cents to $59.98 per barrel on Thursday. The contract closed above $60 per barrel on Wednesday for the first time since November. Brent crude shed 9 cents to $67.69 per barrel on Friday. It gave up 64 cents to $67.77 per barrel in London. 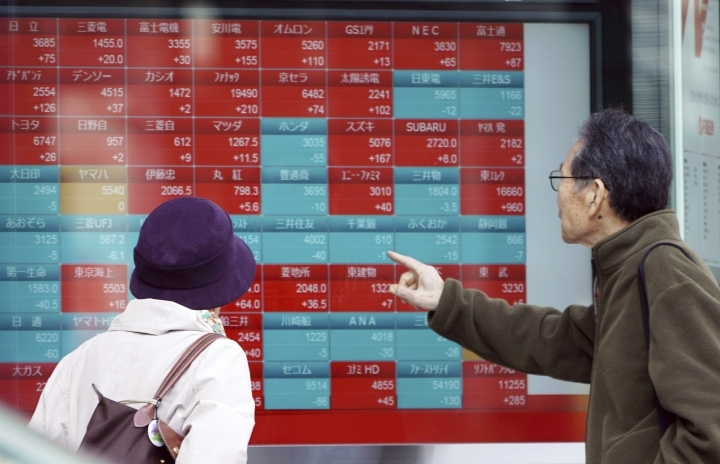 The dollar fell to 110.77 yen from 110.81 yen late Thursday. The euro rose to $1.1376 from $1.1374.